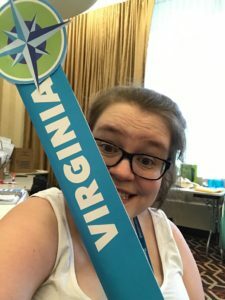 Historically, #DysConf Lobby Days have been on the hottest days of the year. This year, at with a high of 91 degrees, it was actually the coolest Lobby Day we’d had so far… and let’s just say I FELT every single one of those degrees. We arrived downtown later than we’d planned and booked it to the Capitol for our group photo as best as a group of POTSies could. I got to help hold the banner in the front row (holding banners is a rarity for me as a tall person), but I was relieved when the photo taking was over because OH MY GOSH it was bright and hot out. 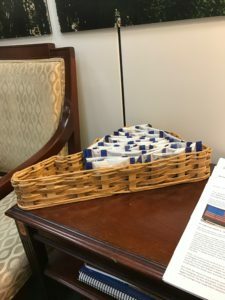 Senator Warner’s office gives out peanuts in Virginia shaped baskets because #SouthernHospitality. 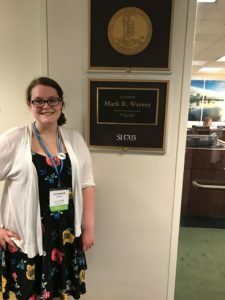 Our meeting with Senator Warner’s Legislative Aide went very well—she was extremely kind and passionate about her job. She was brand new to her position—just three weeks in—but had been working in the health care field for quite some time. 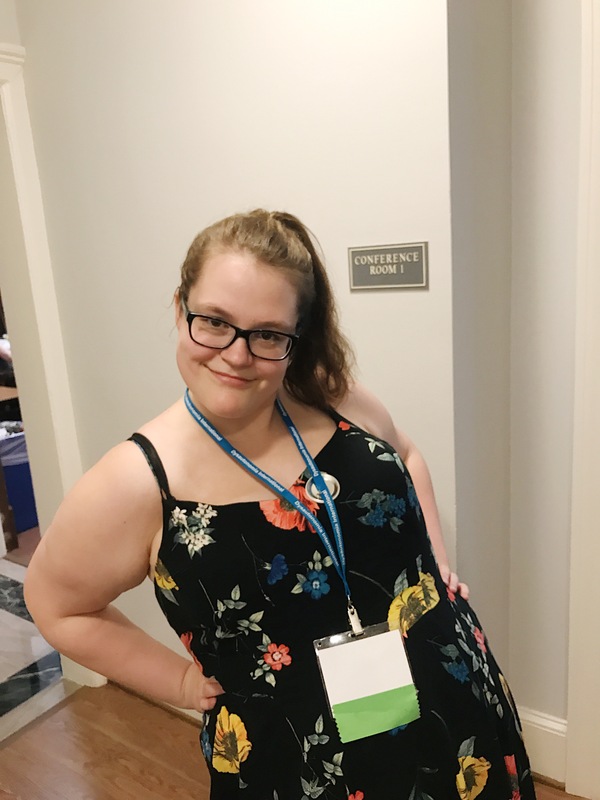 She listened to us closely and thanked us for educating her on dysautonomia as she hadn’t gotten to learn about disease-specific issues in her career yet. We all felt very motivated after that meeting to go on to our other ones. Our group split in half after that point—mine went on to meet with Representative Comstock’s and Senator Kaine’s offices. When we came out of the building, there were ambulances next to the Capitol and policemen blocking the streets and almost no cars anywhere. We later found out that a car had run into a barrier, injuring a policeman, and the police detonated the trunk to see if there was anything dangerous inside the car. All while we were yards away. Always fun on Capitol Hill, right!?!? 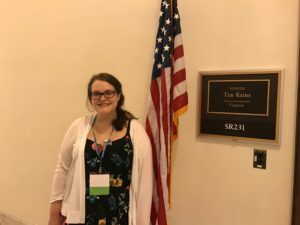 Because of the blocked traffic, we had to walk back across the Hill this time (my shoes were tearing up my feet… NOT fun), and we hung out in the Dirksen cafeteria until our meeting with Senator Kaine’s office. Meeting with Senator Kaine’s office was great—it was definitely a flashback to my visit last February—and his staff was so enthusiastic about health matters. 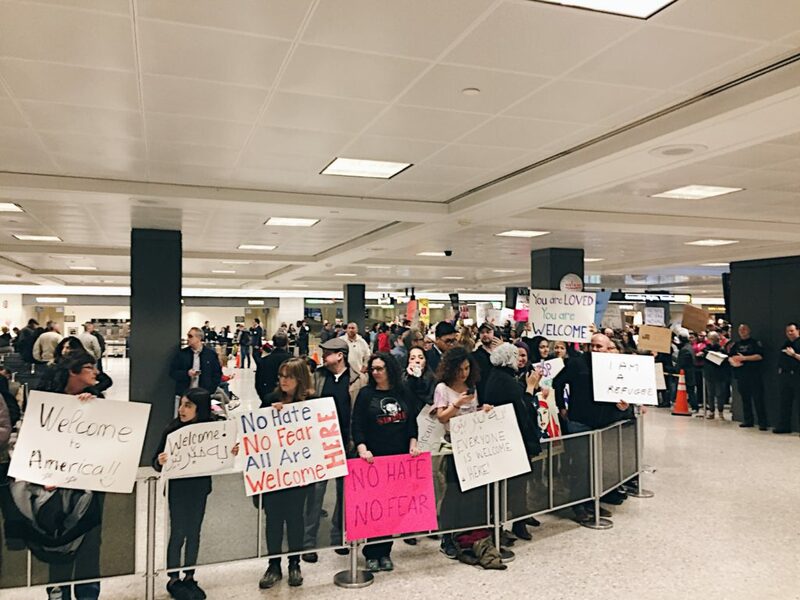 It meant a lot to have our voices heard (and I did feel like our voices and concerns were heard by everyone we met with); it was heartening, it was what’s SUPPOSED to happen when you meet with your representatives. It’s these types of moments that legitimize Schoolhouse Rock videos—the process seems to be working correctly! We walked back to “home base” after our meeting which was a room at a United Methodist Church building on Capitol Hill where we provided more snacks and drinks where the buses could pick us up. But since the accident had closed everything down on the Hill, our leaders were scrambling to figure out where to send us to get picked up. When we finally got on the buses home, my brain started to slow down… because this meant the conference was fully over. I tried to calm down, but I still had the adrenaline of the last few days in my body. We got back to the hotel and I said more goodbyes (there are some people you have to say goodbye to at least six times) and my dad picked me up on his way home from work. I came home with way more stuff than I arrived with—I got to take home some leftover materials and souvenirs. I arrived home, had dinner, took an hour long bath, and was surprised at how long I stayed up that night—I was still wired. I missed everyone terribly from the moment I left, but was glad to be back in my own bed (there’s nothing better). Lobby Day was HARD, but more so physically than it was mentally. Sharing our stories was easy and natural. We’ll be following up with our representatives’ offices to see if we can really make change happen (hopefully we can! )—but the important thing is that it’s in their heads now and that we’ll keep going back, even if it requires another visit in 90 degrees. I’ll just bring better shoes next time and hope no accidents happen. FEEEEEEEELING GOOD THAT LOBBY DAY’S OVER! I’m doing what I hate… for charity!!! Yes, I want to see a picture of your golden retriever puppy, did you really have to ask? 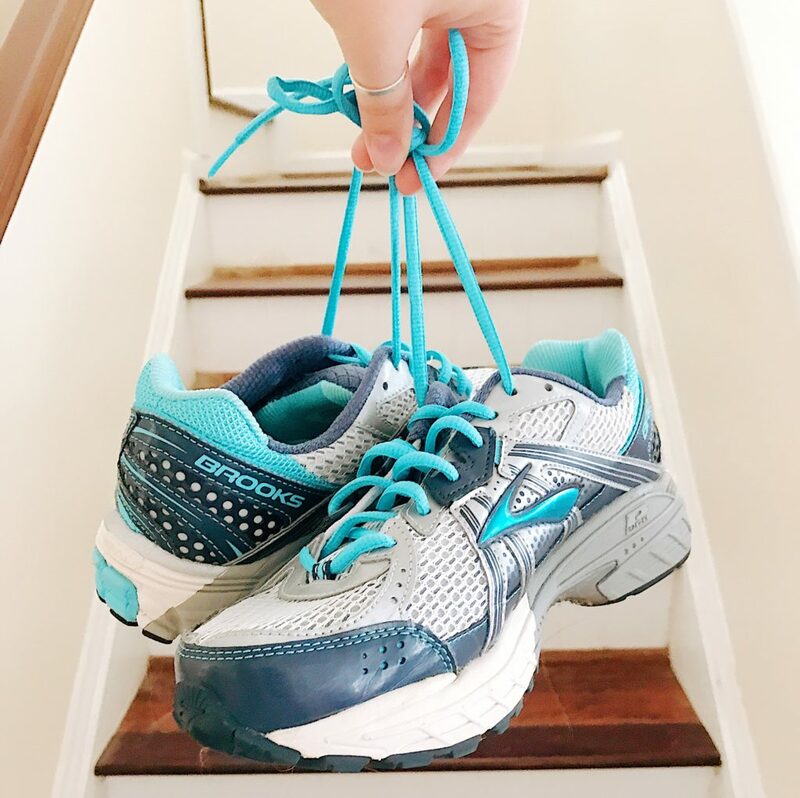 Here’s the catch about me and exercise, though: I’ll do it for a good reason. Usually, that reason is to get my doctors off my back. I have a really good new reason though. In 10 days, I’m going to walk and raise money for my all time favorite charity, Dysautonomia International. SO HERE’S WHERE *YOU* COME IN. 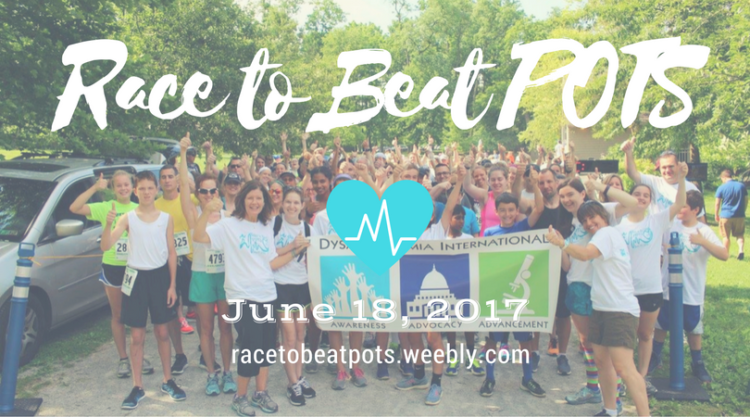 Dysautonomia and POTS are so, so common but barely have any recognition or funding. In the United States, an estimated 1 to 3 million Americans have POTS. By comparison, 400,000 people in the United States live with Multiple Sclerosis, and 1 million have Parkinson’s. Nearly everyone is familiar with MS and Parkinson’s—as we should be! I want POTS to have the same recognition and funding as MS, as Parkinson’s. I want every disorder that affects and take so much from so many to have adequate funding for research. In the middle of June. So, will you sponsor me? I know a mile doesn’t seem like much, but I currently do about 15 minutes of cardio every day on my recumbent bike—and walking a mile will be a huge challenge for me. One of my cardiologists told me, “You will never enjoy exercise, your body was designed to hate it.” I suffer from excruciating back pain when I go walking in addition to tachycardia, sweating, joint pain, weird tingling sensations and general grumpiness. (Tell me you wouldn’t be grumpy if everything in your body hurt.) But the statement this makes: that I’m doing what I can, that I’m on my way to recovery every day, and helping Dysautonomia International in the process? Let’s do it, man. It would mean the world to me if you could spare a couple of dollars for Dysautonomia International—I volunteer what I can to this amazing organization that changes lives, and if you could help us continue what we do with a donation—I would appreciate it so much. I realize this was a bit long. But that’s a fourth fundamental truth about me—I have difficulties being concise. A month ago, I had one of those big nights you remember forever. So now’s the time to share—forgive me if it’s a bit long, but when you get your 15 minutes of fame, you document it thoroughly, even if it’s belatedly. 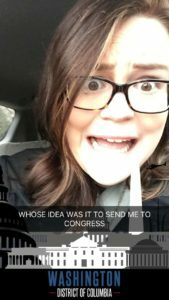 One of my state senators, Tim Kaine (and still America’s step-dad, thanks John Oliver), put out a form for Virginia residents to share their stories about the ACA and how it affected them. I wrote him a letter about how provisions of the ACA like mandates that patients with pre-existing conditions can’t be denied care and children can stay on their parents’ insurance until they’re 26 were life-changing for my family and me. 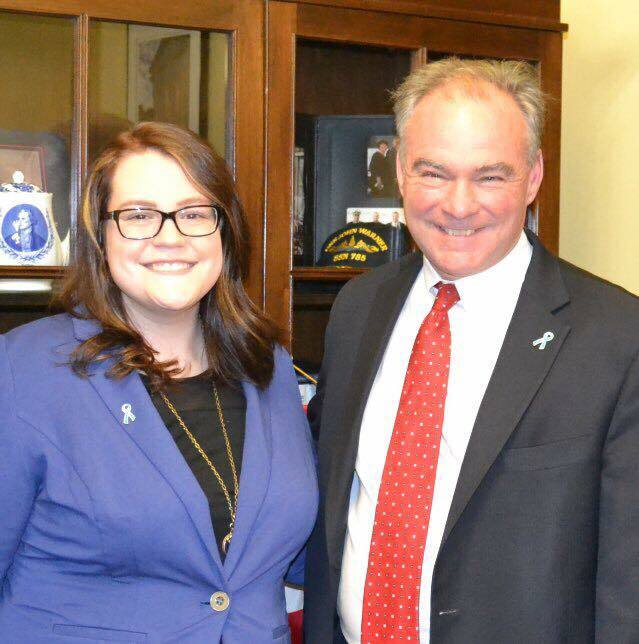 A few weeks later, his staff got in touch with me and asked permission for Senator Kaine to share my story. I fell over myself saying “yes! of course!” because that’s one of the many (many) reasons I’m open about my life. If anything I’ve been through can help someone else, if my story can be shared to help others for a bigger, positive purpose, then yes, share it. On February 9, during Tom Price’s hearing to become the Health & Human Services secretary, Senator Kaine read a selection of the 1,000+ letters sent to him about the ACA and mine was one of them. I nearly fell off my bed when I watched the video, my hands were shaking watching my senator, a man who was nearly Vice President of the United States, read my words and have them entered into the senate record. Throughout my life, so many things I have said have been brushed aside and ignored by countless people in various positions of authority—doctors, teachers, school administrators, church leaders, bosses, group leaders in peer projects… For me, validation of my feelings and experiences from individuals I value is particularly significant and in a very real sense, healing. I don’t know how much more validated I could possibly be: I was being supported by a high ranking government leader, vowing to take my side and fight for the ACA because of my story and stories like it. I was flying high for the rest of the month, assuming these were my 15 minutes of fame. Then, I got another phone call at the end of February inviting me to be Senator Kaine’s personal guest to the Joint Session of Congress, basically the State of the Union lite. 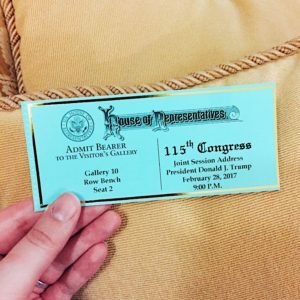 So how do you prepare to attend a Joint Session of Congress? I got to bring my parents to the Senate Russell building on February 28. We arrived in the late afternoon and got to know several of Senator Kaine’s staffers who went over my schedule for the evening. What nearly every person said is that constituents’ stories are what drive them to do their jobs. No one I spoke to has a personal agenda or even an axe to grind—they’re doing their jobs to make the country a better place. I did an interview for a local TV station (I never got to see if they used it, but the reporter and cameraman were awesome), had some snacks (three cheers for free Virginia products—peanuts and Pepsi beverages) and kept trying to think of things to say that would make me sound smart. Senator Kaine met with my parents and me for a good half hour—he’s the real deal. He took so much time to ask my parents about how and where they grew up and met, about if they had any other kids (my brother couldn’t come because he had to work, we’ve given him endless grief about this)… and when it came to me, I felt heard. I’m sharing this not to necessarily convert you all to be Kainiacs (another Tim Kaine nickname we can attribute to John Oliver), but to remind you guys that good members of government exist despite Congress’ terrible approval ratings. Yes, some members are nothing short of disconcerting, but others are fueled by constituent stories and want to stand up and fight. I’ve got some really cool senators for my state–find out if you do, too. After our meeting, Senator Kaine and I did a tele-town hall, where a software system calls Virginia residents and invites them to join in on a conference call. The Senator gave me the opportunity to again share my story about what the ACA meant to me before he answered people’s questions. I was nervous and scared but daaang. I did it. I told everyone how for a long stretch of time in my teenage years, I felt more comfortable in a doctor’s office than I did in a classroom. How I realized early on that it didn’t matter what I wanted to do when I grew up—I needed to choose a career that was stable, lucrative and had good health care benefits, not one that made me happy. I told them how the ACA changed that and gave me hope—it gave me the comfort that I could take extra time in school because I would have my parents’ insurance until I was 26. I could even take time off to work on my health and health only if need be. How it meant I could buy insurance and be my own boss, freelance as a graphic designer, a dream of a job I had in my mind. I also told them that the GOP calling the ACA into question with rallying cries of “REPEAL!” without a solid, safe replacement had brought all of this crashing down. I’m now terrified that my loved ones and I will lose our insurance and our futures—we all have pre-existing conditions. Will we be OK? Will we ever have health care again? I told them that I’m an active participant in my health, I follow my doctors’ orders, I’m a big volunteer in my patient community, I don’t take my diagnoses lying down. But for whatever reason, the plans I’ve heard from the opposition party seem to promise that I’m going to be punished for illnesses I did nothing to deserve and have done everything to get rid of but cannot. I reminded everyone that health crises happen to all of us, and if not us, to someone we love, it’s just the nature of life. Whether it’s a chronic illness, cancer, an accident—everyone needs extra care at some point in their life, and that’s why plans and laws with protection are so important to me. After the tele-town hall, I got ready to head over to the Capitol for the grand event. When the Senator’s office heard about how much difficulty I have with standing, they arranged for a senate doorkeeper to bring over a wheelchair and assist me from Senator Kaine’s office to the Capitol. This was the first time I’ve ever used a wheelchair (and the first time I’ve ever even considered using a wheelchair.) My parents were the ones insistent on me using it but I felt guilt for taking it at first—at the time I was having a good energy/health day and I felt like I was somehow gaming the system by accepting an accommodation I didn’t at the time desperately need. But when I thought about the standing in security lines, I accepted. For those of you unfamiliar with Capitol Hill—the congressional office buildings are connected to the Capitol with underground tunnels and and a trolley system. But even with the tunnels and trolley, it’s a ton of walking and standing. That night, the route to get to the House Gallery was longer and more convoluted with at least three metal detector security check points along the way. 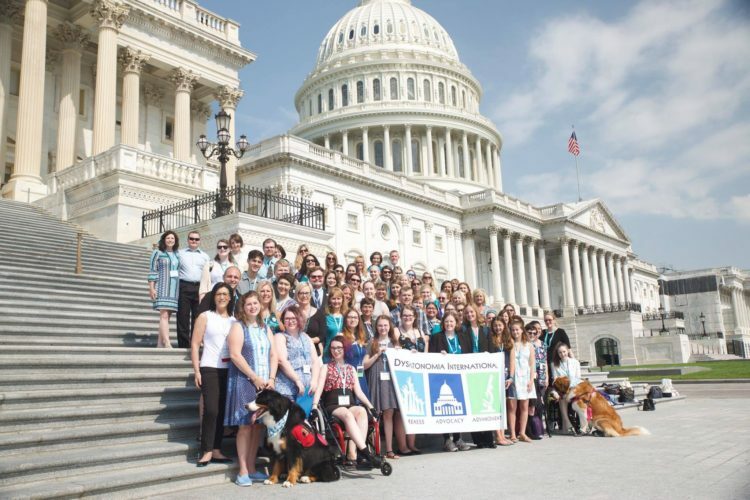 How appropriate to have that continued realization that accommodations matter at an event where I represented the ACA as a young woman who’d been living nearly her entire life with chronic illness. After the labyrinth of halls and security checks, I arrived at the house chamber and got to my seat. 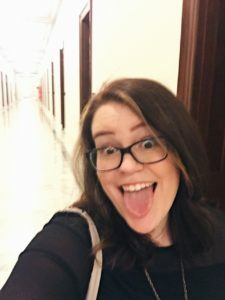 I was tucked away in a back corner of the room which I thought at first was a terrible place to sit but turned out to be a huge score—I was next to several family members of members of Congress and got to network by sharing a short version of my story and told them about Dysautonomia International. I also sat 10 feet away from Sean Hannity—that was a huge trip for me seeing as my dad exclusively watched Fox News when I was a kid. Leading up to the speech, it was hard to make out who was who on the floor of the House—from my seat with a few exceptions, everyone looked like the same old white man. (Sorry.) Thankfully, I had a great view of Senators Kirsten Gillibrand and Elizabeth Warren, two of my personal heroes and women I’d love to both see run for president one day. The speech itself was surreal. I live for the State of the Union, and even though it was just a Joint Session address, it sure felt State of the Union-y to me. It was very different to hear President Trump, a new person, a new president, deliver this type of speech–President Obama was the president of my teenage years and young adulthood. It felt foreign to (1) be there in person and (2) witness a president so polar opposite to the one I was so familiar with deliver remarks in his place. The most challenging part of the night for me, even more so than the physical strain standing up and sitting down repeatedly to clap for respected guests and a couple of issues I agreed with was the deafening applause from the Republican party when Trump brought up repealing the ACA in its entirety because it’s been a disaster, period. I was seated on the Republican side of the room and getting caught up in their applause was painful. I closed my eyes, willing them not to cry because hearing “repeal of the ACA” leaves my future uncertain, bleak, nerve-racking. I’m publishing this post after the AHCA was thrown out before a vote. It looks hopeful that the ACA will remain the law of the land for a while, and even if that leaves me feeling a little safer, I still feel the need to advocate for it. Because health insurance is the difference between life and death for millions, my loved ones included. This is the face you make after you crushed it networking, did multiple interviews, had a great time with your senator, advocated for what matters to you, and feel like you’re on top of the world. NO BIG DEAL. What I want everyone to get out of my experience is that this all came from writing a letter to my senator. I know that attending a Joint Session of Congress might not be the dream night to other people that it was for me, but it made some waves–I showed up in my local newspapers (and a couple of national ones!) and the issues I advocated for got some light. If there’s something you care about, start writing. Call your members of congress. It’s scary at first, but it’s not so bad. E-mail them from their websites. Write letters. Fax them online. There are so many services that make these things so easy. If there’s something on your mind (even if it’s contrary to what I’m promoting! ), let them know. Be active in your government, just like Schoolhouse Rock taught you. AND! Please be nice to the staffers! Especially the ones on phone duty! I’m a rambler when I’m nervous. And when I’m not nervous. When I’m perfectly fine, when I’m happy, when I’m angry, when I’m every emotion, I usually talk. When someone gives me a question I don’t have a good answer to or don’t want to answer, I still answer. I’ll give them an answer to a related question without addressing the fact that I’m not even answering the thing they inquired about. If I’m slick enough, they won’t even notice. But maybe now, after this declaration, they will. Sometimes friends ask me about how I’m doing with POTS—and even though I’m always game to talk about Dysautonomia International and the work they’re doing, or maybe cool new research, or the fact that my arm fell asleep in under 30 seconds last night–I know my friend is kindly asking about my chronic health problem. And here’s where the real baggage comes in. When there’s been no progress with POTS, I don’t want to tell them that. I hate that there’s been no changes. I hate that there’s nothing new to report in my health, I hate that sometimes it’s even getting worse, because then I’ll have to explain that yeah, sometimes that just happens, and no, it’s not my fault (even though I occasionally blame myself when I shouldn’t) because I don’t want them to blame me either (even when I know my friends and decent humans would never do that). I run away from the reality of “chronic”, I run away from the reality of life and I divert their attention. They ask about POTS, I answer about something else. Sometimes I answer about the progress I’m making in therapy, how I’m not standing still or regressing. 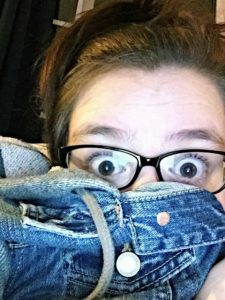 How I’m moving onward, forward; how I’m doing something that they can be proud of—even though the very act of getting through a day with one chronic illness, no less a handful, is something they can be proud of their friend for. Because the vulnerable side of me feels like if I can’t produce results in one area, I better produce results in the other. Today is a day where I can see things clearly, and I want to say and reaffirm to myself and to anyone who might struggle like I do at times: please don’t feel like your life has to be strictly results oriented. Making an effort, taking care of yourself, being a kind person matters so much more than producing tangible results in work or in health or in any realm. If you have a chronic illness, leave the results to the doctor. All you’re responsible for is effort, that’s all anyone can ask of you. I want to have those same feelings for myself now, and by having those feelings, I think I’ll be able to be more honest with myself and with my friends. And maybe I’ll get around to answering your questions head on. Happiest of happy holidays, friends! The gift giving holidays are rapidly approaching and I’m procrastinating my holiday shopping like nobody’s business. 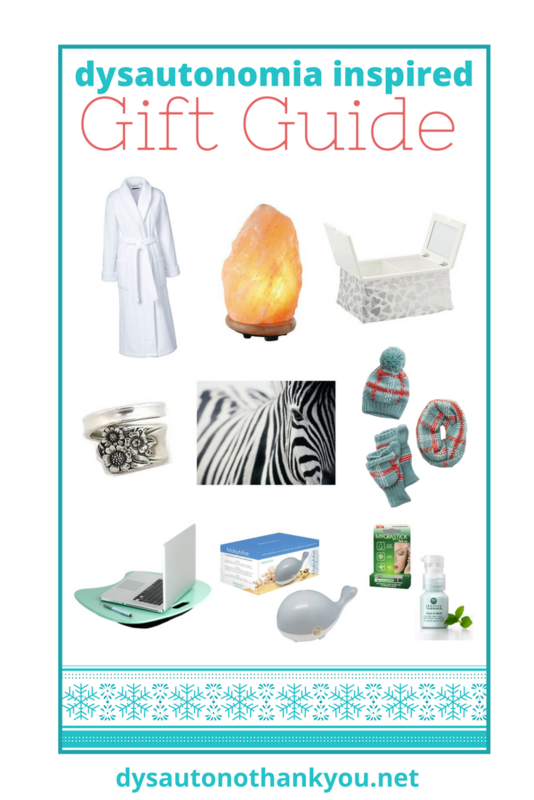 That doesn’t mean I don’t have time to help you guys in your holiday shopping for your loved ones with dysautonomia. And if nothing here strikes you, check out last year’s guide, because I feel very confident that something will strike you as a good gift. Shopping reminder: when you use Amazon, shop through smile.amazon.com and select Dysautonomia International as your charity of choice! 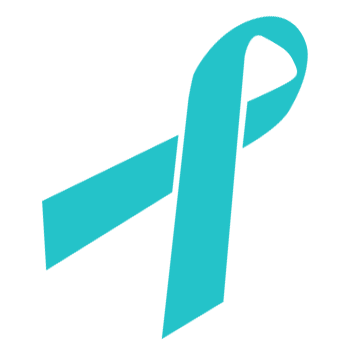 6% of your total purchase price will be donated to them at no extra cost to you! Some people feel invigorated and reenergized from a shower. POTSies are not those people. Bathing can be beyond exhausting, and since you can’t change that fact, you can give the gift of a comfortable calm down in the form of terry cloth robes. POTSies can sit and dry off in warmth and comfort rather than shiver in the cold in makeshift towel coverings. I got the pictured Lands End robe for Christmas last year and it’s my favorite robe that I’ve ever had. POTSies live on salt, so it’s no surprise that so many of us are intrigued by the possibilities of Himalayan Salt Lamps being helpful. Allegedly, the lamps produce tons of negative ions which are supposed to help oxygen travel our brains more easily, help us feel more alert and even clean the air we breathe. According to all of the research I’ve done, there’s no basis for the claims that Himalayan Salt Lamps can create negative ions strong enough to produce any of these benefits. That doesn’t mean it isn’t an awesome looking lamp, and that people on high salt diets won’t appreciate having a giant salt rock as a lamp and decoration. For that reason, I still recommend it as a great gift to give. They come in tons of different shapes and sizes. Most everyone I know with dysautonomia has a personal pharmacy. Some of us use clear plastic storage boxes, shoe boxes or large trunks if it calls for it. Still, it’s nice to be offered alternatives to our personal pill storage (or even storage options for our other medical supplies, because we got ‘em). This is the perfect time for a gift buyer to give us the “ooh, pretty!” options we didn’t feel like we could treat ourselves to before. The Spoon Theory is huge in the chronic illness community—it started as a way for us to explain our limited energy supply in terms of spoons—and has evolved into an identity. The chronically ill are Spoonies, we need more spoons (or energy) in order to get through the day. A quick way to pay homage to the Spoon Theory for your chronically ill friend is by gifting them a spoon ring—rings made out of old spoons that are great as thumb rings in particular. I’ve had one for about five or six years and have gotten endless compliments on it. Etsy is the best place to find them in my experience—and here are some great ones. One of the good rules of gift giving is to get someone a gift that they wouldn’t buy themselves. When you’re chronically ill and strapped for cash, you’re not going to spend your limited money buying artwork for your bedroom, no matter how much it improves your morale. I can’t say what your friend/brother/sister/daughter/son/girlfriend/boyfriend/acquaintance/secretsantaperson will like best in terms of art. If you’re going with a dysautonomia fighting theme, look for turquoise, ribbons, spoons, zebras if they have EDS. Otherwise, just look for something that looks nice, something that reminds you of the best parts of them. Give me a room full of POTSies. Half will be shivering and half will be sweating. Temperature control does not exist where dysautonomia is concerned and winter does nothing to help matters. Even though a lot of POTSies run warm (or even sweaty—myself included), if it gets cold where you live, hats, scarves and gloves are the classic gift for everyone, dysautonomia or not. They’re festive, they’re pretty, it’s hard to go wrong. Also, a common comorbidity with dysautonomia is Raynaud’s Syndrome which leaves peoples’ feet and hands feeling numb or freezing cold due to poor (or truly just garbage) blood flow. So if your friend is constantly rubbing their hands together complaining that they’re freezing, this is your time to shine as a thoughtful gift giver. Some people with dysautonomia are bed bound. And even the ones who are not bed bound still tend to spend a lot of time in bed or lying flat on their backs because they’re least symptomatic that way. Essential oils are tricky. There are some companies trying to suggest that their blend of juniperberrycitronellaspruceetcetera is going to help me forgive people if I rub it on pulse points and heart. But I do know for a fact that I feel a little calmer when I take a deep breath and inhale peppermint very deeply. So with that in mind, that I’m not suggesting that grapefruitpeppermintcinnamongingerspice in water will cure dysautonomia, I’ve heard some nice things about diffusers—if nothing else that they make your loved one’s house smell amazing and that’s a nice gift to give. Plus, I found a diffuser that looks like a WHALE. If that doesn’t excite you, nothing will. So another thing about aromatherapy. These things (an essential oil rollerball and headache cream) will not make headaches go away. But they help so much and are as important to my routine of treating headaches as ibuprofen and drinking lots of water or consuming caffeine to fight off a headache. I’ve become a bit of an evangelist about these two products (I don’t get any kickbacks from them, but I’d love to), and while it might seem weird to give as a Christmas gift, I can guarantee you that even though these are things I buy maybe once a year (because yes, they last that long! ), I would also love to receive them. They cool your skin on contact and help ease the tension you feel during headaches and migraines. I love them and maybe you should buy a couple for yourself, too. Donation to Dysautonomia International in your recipient’s name! Did I miss anything awesome dysautonomia themed gifts this year? What’s on your wish list or shopping list? Share in the comments! Saying "yes, please" to everything good in life and taking a rain check on autonomic dysfunction.